St. Martin's Griffin, 9780312681876, 304pp. In 2009, Drs. 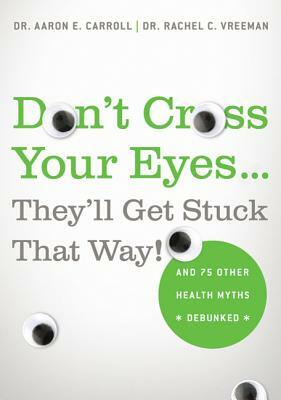 Aaron E. Carroll and Rachel C. Vreeman explored a wide range of myths and misconceptions about our bodies and health in the media sensation, Don't Swallow Your Gum!, featured on The Dr. Oz Show, CNN, and in The New York Times, USA Today, and more. • Eggs give you high cholesterol. • You should stretch before you exercise. • Kids in day care catch more colds. • Sit-ups or crunches will flatten your stomach. • A glass of warm milk will put you to sleep. With a perfect balance of authoritative research and breezy humor, Don't Cross Your Eyes . . . They'll Get Stuck That Way! exposes the truth behind all of the things you thought you knew about your health, your well-being, and how the body works. “Breezy and entertaining, yet relevant and scientific...the authors demonstrate clear research and documentation.” —Library Journal on Don't Swallow Your Gum!